The Anarchist aka Niels Hettema is a unique Dutch hardstyle performer full of raw uncut energy. Having performed on various stages like Defqon.1, Q-BASE, Intents Festival and X-Qlusive Holland, The Anarchist is no stranger to a wild crowd full of excitement ready to be entertained by his insane tracks, shock factor & total anarchy on stage. With his signature "rebel punk" look and attitude to match, The Anarchist really knows how to draw a crowd and raise hell on any stage or at any club. The Anarchist signed with Scantraxx records as of late 2010. His recognisable and harder, but still accessible, sound is widely supported by the hardstyle scene. 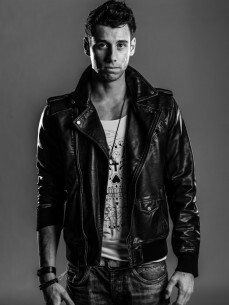 His music is regularly featured on popular shows such as Digital punk's "Unleashed" and "Hard with Style" by Headhunterz. The Anarchist also features on several albums & compilations, most importantly the Prophet's Louder. When not on stage, most of his spare time is spent in the studio of professional music producer Thomas Duddridge, passionately creating ever more original tracks in the highest possible quality to impress his next audience. Experimenting with different sounds and techniques in every single production to keep his style fresh, Thomas looks after every single track, tweaking it to perfection like no one else can. With the combination of his experience as a professional DJ, his energy and showmanship in every single performance, and some of the most promising new tracks in the hardstyle scene, The Anarchist is sure to bring an unforgettable experience to any event!